The Filipino spirit is tested once again with another calamity that proved that there is not a storm so strong that can wear out the country’s unity. Relief drives are being organized left and right, and everyone is filled with the same selfless action to help by sending out used clothing, canned goods, bottled water, medicines, as well as volunteering time and effort in relief operations, packing goods, and distribution to affected areas. Getting these contributions to its destination is already proving to be quite the challenge, with the urban traffic and the rigorous commute, yet everyone still finds a way to carry on. This is why Globe Telecom and Grab Taxi, the country’s leading taxi-booking mobile app, have teamed up to give the telco’s over 36 million prepaid, TM, and postpaid subscribers access to hassle-free and affordable commute during these times. By stripping off Grab Taxi’s booking fee of P70, every Globe subscriber who is a Grab Taxi patron is assured of an affordable, safe, and comfortable ride around the Metro with savings to boot to encourage more donations. With Grab Taxi, you can volunteer in various relief and repacking operations and drop off donations worry-free, at a price that’s easy on the pocket. “Given the recent devastation that happened in the Visayas, Globe, in line with our Bangon Pinoy program, constantly finds ways to make our offers relevant to the times and use our products and services in helping those in need. We hope that through this, we are able to contribute and provide convenience and bring more value to our subscriber's hard-earned money who are devoting their time and effort to be of assistance to others," shared Globe Mobile Data Services Head Jenny Granada-Echevarria. Currently, Globe and Grab Taxi allow customers to pay a discounted booking fee of P50 instead of the regular fee of P70. Grab Taxi makes it possible for users to share ride details over Facebook and email, so loved ones can track taxi routes and other important details real time, making the journey safe and secure. The driver’s phone number, plate number, and other important details will be made available to users even before they get in the cab. Further, all cabs linked with the Grab Taxi network is of the finest quality, assuring customers a cool and comfortable cruise throughout the city. Download the Grab Taxi app for free from the Apple App Store and Google Play Store. Grab Taxi’s booking fee of P70 is free for Globe subscribers from December 1-15, 2013. 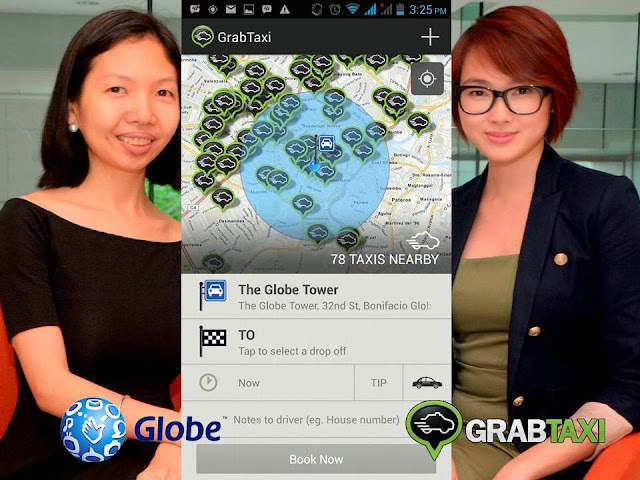 PHOTO CAPTION: Globe Mobile Data Services Head Jenny Granada-Echevarria with Grab Taxi’s Natasha Bautista partner together to provide one of the most convenient services especially for the season of giving. Wow good job on writing this article.